We’ve heard it before, and we’ll probably hear it again – for businesses looking to reach current customers and to gain new ones, mobile is one of the most important channels they can invest in. Smartphones and tablets have been making gains among Internet users for some time now, but this year, we’ve reached the point where they’ve gained dominance. According to a new report from comScore Inc., we’ve passed the threshold where the majority of time spent on digital media is with mobile apps, at least in the U.S. In a report released last week, researchers from comScore found mobile apps now account for about 52 per cent of the time spent with digital media – just a little bit over half of their digital media interaction time, finally eclipsing time spent with the desktop. 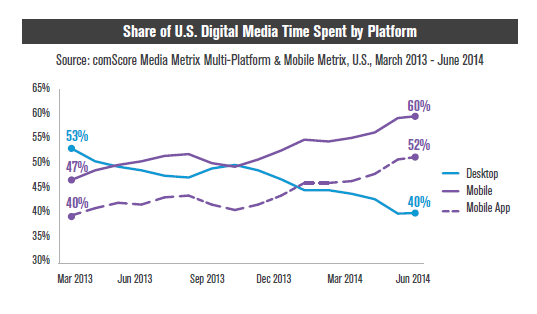 Plus, when it comes to consuming digital media on mobile devices, seven of every eight minutes is with a mobile app. About 57 per cent of U.S. smartphone users will launch an app every day of the month, compared to just 26 per cent of tablet users, and about 34 per cent of users will download an app at least once a month. What’s especially interesting, though, is that people are creatures of habit, returning to the same apps over and over. That’s not surprising if you’re a mobile developer jostling for app downloads and usage time, but still – 42 per cent of all the time spent with apps on a smartphone is with just one single, most used app. Plus, a user will spent almost three out of every four minutes of app usage time with the same four favourite apps. So what are the apps that people seem to use the most? As you might expect, Facebook is the big one – but that’s just among the young. Facebook is the top app for those aged 18 to 24, 25 to 34, 35 to 54, and 55 and over. Other top apps include YouTube, Google Play, Google Search, Pandora Radio, Google Maps, Gmail, and Instagram. All that being said, people are indeed still using desktops. Desktop computer usage went up one per cent this year, and while that growth doesn’t come anywhere close to what mobile devices are experiencing, it doesn’t mean desktops are exactly dead, either. 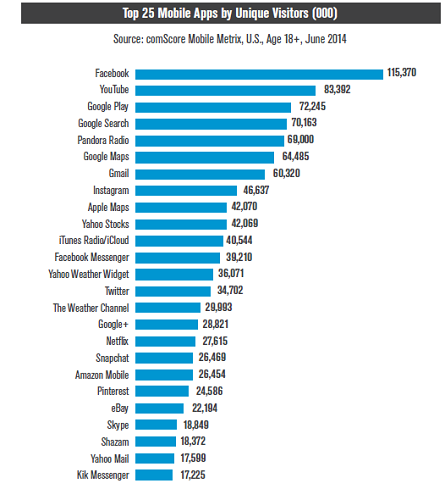 Still, this comScore report further confirms what we’ve already known – mobile is a space that’s only going to continue to get bigger, and businesses would be short-sighted to ignore that. For the full report, head on over here.